When it comes time to have your high end area rug cleaned, you may already have a go to cleaner, or you may be looking for a cleaner for the first time. It is very important to make sure you find the right company to service your high end area rug. 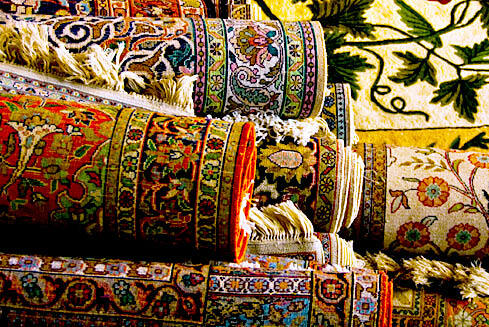 One of the best ways to find yourself a high quality oriental rug cleaning company is to do an online search. Simply conducting an online search may sound a bit obvious, but the trick is to look for a company with an abundance of reviews, then read through reviews. Online reviews are essentially the new age digital word of mouth. A company with terrible reviews may throw up the red flags necessary to help you avoid a possible disaster of a service. On the other side of the coin, a company with a large amount of positive reviews should typically indicate that you would enjoy a great service experience. 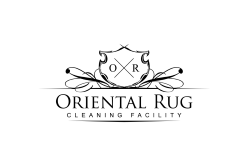 Our Oriental Rug Cleaning company is highly rated online with numerous five star reviews across a multitude of platforms. We are proud to provide a fantastic service and a great customer experience that many of our customers have found good enough to share about online. If a customer calls us and is looking for a service we do not provide or is out of our service area, we always recommend to them to search online and try to find a highly reviewed and rated company to use, as it typically reflects the type of service you will receive. Platforms like Yelp, Angie’s List, Google and even FaceBook can help you find the right company for you, backed by customer reviews. As you take your time to research different companies in an effort to find the right one for you and your needs, there are some things you can ask about and take into consideration. 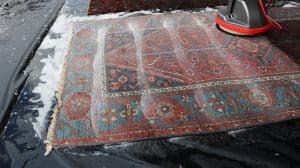 Just as you are going to want to find a company that is highly rated and well received online, you will also want to make sure that company knows what they are doing, uses proper equipment, procedures and solutions, and performs the service themselves, as opposed to outsourcing the rug washing service. The most thorough, effective and safe washing process for high end area rugs is the full immersion washing process. The process in its entirety consists of a thorough inspection, a complete rug dusting, a flushing and agitation on the wash floor and a complete cool air drying process. Now, these steps can be completed one of two ways. There are large machines that can carry out these tasks, or actual rug technicians using specialty hand tools can perform the services. Being that the first step is an inspection, that part is typically carried out the same way. 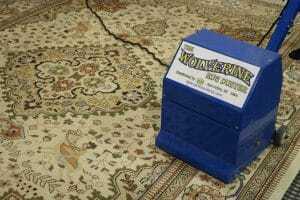 The inspection is performed by a master rug technician who can search for preexisting conditions within the rug, for possible issues that could arise during the washing process (dye transfer, color bleeding, fringe damage, foundation issues), as well as the actual make of the rug (fibers used and crafting process.) These all help to guarantee the safest and most effective service is performed on your rug. After the inspection, the rug is then dusted. This process can be carried out by a machine or a rug technician using a special tool. The area rug dusting process is basically a procedure that lightly beats the back side of the rug in an effort to knock loose any dirt, dust, hair or other loose contaminants that have collected into the surface pile of the area rug. This step is incredibly more effective than any vacuuming service that could be performed. When the area rug dusting is performed my a machine, the rug is simply loaded into a large machine that tumbles the rug. As the rug tumbles through the machine, it is lightly beaten. As the loose contaminants in the rug are knocked out, there is a vacuum and a filter within the machine to collect all that has been knocked out of the area rug. At our facility, each area rug is dusted using a specialty tool that is hand operated by one of our rug technicians. Our hand dusting process involves the area rug being laid out upside down on a custom built grated flooring, where the rug technician will use the special hand operated tool to lightly beat the back of the rug, effectively knocking out a large amount of loose contaminants from the rug. Once the dusting is completed, the customer grated flooring is rolled up and the mess left behind is cleaned up. This process can produce multiple pounds of dust, dirt, dander and hair from within the surface pile of a single rug. When the urine extraction pre treatment is not required, then next step would be the actual washing of the rug. Again, this process can be carried out by a large machine or by a rug technician using specialty tools and proper solutions. When a machine is used, there are typically two different types of machine washing processes that are performed. One is essentially a bath in where the rug is loaded into a tub where a washing gently cycles the rug around for a certain period of time. The cycling of the rug is meant to agitate the fibers. The other machine method is where the area rug is fed into the machine in an assembly line fashion. The machine will use a combination of jets and rotating brushes to clean and agitate the fibers. This machine method is typically more effective that the latter. Our washing process is the more intimate hand washing process carried out by one or two (depending on the size of the area rug) of our area rug technicians. This process involves laying the rug out on a special wash floor and beginning to flush both sides of the area rug with cool water using a high flow pump and hose system. After the initial flushing, the technician will apply the proper solutions required to treat each area rug specifically. The pile on the surface and the fibers on the back (non tufted rugs only) will then be agitated using a hand operated orbital tool with specialty brushes attached. 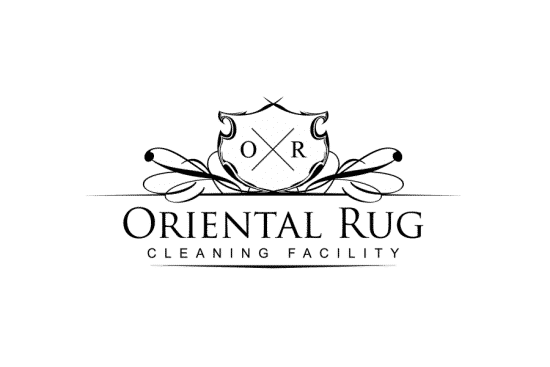 Once the agitation process is completed, the rug is then flushed on both sides and checked to ensure all of the cleaning solutions have been completely rinsed out. After the washing process has been completed, it is time to dry the rug. This step is very important as improper drying of a natural fiber rug can cause permanent, irreversible damage. The drying process is typically performed in similar fashion from one area rug cleaner to the next. There will be a “flash extraction” process that is performed to remove a large majority of the water in the rug. This is usually performed by a machine that spins the rug at very high speeds, using the centrifugal force to pull most of the water out of the rug. 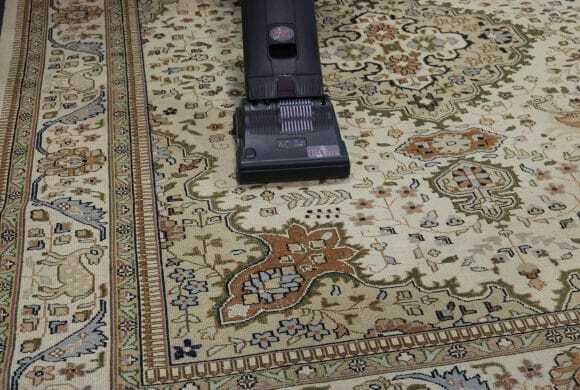 The other method involves using a suction tool that pulls most of the water in the rug out by sucking it through the middle of the rug while it is rolled tightly around the specialty tool. 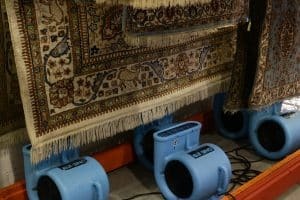 Once most of the water has been extracted, the area rug will then be placed on a drying rack that will use cool air movers to help dry the rug in a safe and efficient manner. All water and drying air movers should use cool water and cool air. Hot water and heated air can cause damage to a natural fiber rug. If a natural fiber rug is not dried completely and in a timely manner, permanent irreversible damage can occur at the base of the area rug. When you are searching for a company to service you high end natural fiber oriental rug, or your standard in home synthetic rug, search for a company that knows what it is doing. Remember to search for a company with an abundance of positive online reviews. When you call, you should feel comfortable asking questions. Any professional rug washing company will appreciate the questions as it will show that you care about your rug and it will give them an opportunity to explain their process directly to you. If you are greeted rudely, or with resistance to your questioning, that should be another red flag for you. Make sure that the company answers your questions thoroughly. Make sure that the person you are directly interacting with is patient and helpful. Mostly, make sure that you feel comfortable with the company you are having service your area rug. Searching for a service company can be frustrating and intimidating as it can be difficult to tell if you are selecting the right company for the job. So, remember that you should feel comfortable and fully helped by the company you chose, no matter who that company is! Having your area rugs serviced regularly, properly and by true professionals will help to ensure a long and healthy life for your beautiful in home area rug. Oriental Rug Cleaning Near MeWhy Use A Professional?